She is one of Austria’s most powerful women in journalism, founded Woman, Madonna, and look! – the country’s most successful women’s magazines – and established the LOOK! WOMEN OF THE YEAR AWARDS to honor exceptional personalities for their achievements. Uschi Pöttler-Fellner is one of Austria’s most successful female journalists. She founded the three leading women’s magazines in Austria – Woman, Madonna and look! –, and, as Editor-in-chief, made them the country’s largest and most profitable women’s publications, reaching millions of readers. 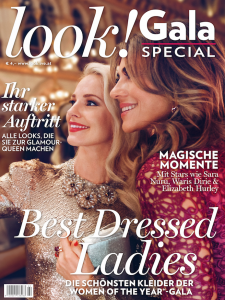 As a woman and a strong supporter of women’s right, Uschi Pöttler-Fellner founded the LOOK! WOMEN OF THE YEAR AWARDS: “We endeavor to bring about a more humane society and empower women to achieve their goals, whatever they may be. The LOOK! WOMAN OF THE YEAR AWARDS can provide inspiration and hope by highlighting the many good things that are being done”. Do we need another women award? As the editor of Austria’s strongest women’s’ magazine group, which includes nine magazines, I am convinced that we do need awards for these „silent“ key players. They are the ones that keep our country, our economy and our society running smoothly. Women achieve great things every day. Combining (seemingly without any effort) job and family and taking care of relatives, if necessary, they can move mountains. We don’t see these heroes recognized in public. We now ask these women to step into the light; we are speaking to all those women who are not appreciated in public when they keep the wheels turning day in and day out – the big wheels like the economy, as well as the small, personal ones – like family. The women nominated in this article also represent those women who do not have a public audience. Those who try to make the world a better bit by bit, diverse and more humane place, using their ideas, strength, love, compassion and dedication. On November 27th Austria´s Women of the Year will be awarded at the famous Vienna City Hall.